For every gardener there is a task that feels more like a chore. A good pair of pruners fits your hand comfortably, and takes care of a wide range of gardening jobs, from snipping off spent stems to cutting roses for an indoor display, to trimming a favorite shrub. 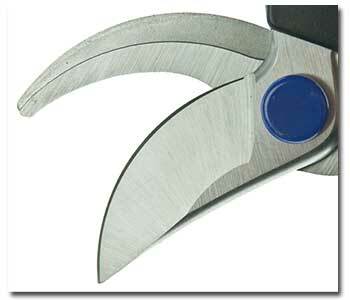 But for many of us, it simply seems easier to replace our pruning tools each year rather than sharpen them. How often have you found yourself going from garden center to garden center, or wasting hours on the internet trying to find the exact same tool that you bought last year that was perfect for you? That costly and inefficient habit is easily broken once you’ve mastered the fine art of sharpening. Simply follow the easy instructions below and that time can be better spent planting something beautiful. The primary reason for keeping our tools sharp is so that the cuts they make are cleaner, allowing the plant to heal more efficiently, and resulting in a healthier plant that is better able to fight disease, insect infestation, and natural stresses. Most arborists prefer diamond files because of their ease of use, even for a novice. You’ll need three levels of coarseness, or grits: coarse, fine, and extra fine. These files, with their long life spans, will be a part of your gardening arsenal for years to come. But let’s begin with a “bath.” First coat your tools with a luprication oil made for tools such as WD-40 or Corona’s Lubrication Oil, leaving it on for 30 seconds. Then put on heavy gloves for the remainder of the project. Take coarse steel wool or a wire brush and apply elbow grease to remove all of the dirt that’s accumulated. Be sure to clean the back of the neck as well. After the gunk is gone, switch to finer steel wool for polishing the shine back into your pruners. Take a cloth and wipe down the tool, removing the little bits of dirt and metal that your efforts have created. Now for the files. Prior to using them, pat them with a moist cloth; the water will keep the file from clogging with the tiny bits of metal you’ll be removing from the blade. Begin with the coarsest file and progress to the finest for the best edge. Angle is all-important. You want to angle your coarsest file to the beveled edge, about 10 to 20 degrees. This is where your gloves are particularly handy; with one hand, apply some pressure to ensure that the tool doesn’t slip. The gloves will also prevent fine pieces of metal from entering your hands. Starting at the inside of the blade, draw the file away from your body and toward the tip of the blade in a curving motion, always adhering to the shape of the blade. Make anywhere from 20 to 40 passes with the file, depending on the degree of deterioration. Switch to the finer file, making the same number of passes, and finish with the extra fine file, again matching the number of passes made.